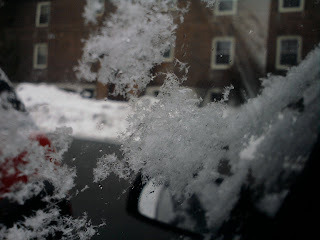 In school, I used to be obsessed with creating geometric snowflakes. While girls were doodling FLAMEs with their names and names of cute boys, I was busy with filling my notebook with snowflakes everywhere. Drawing them inspired me, so it is no surprise to me that watching snowflakes stick to my car window made me want to take photographs again....even in this dreary snowpocalypse weather.